National Assembly passes 2017 budget – Royal Times of Nigeria. The National Assembly and The House of Representatives has passed the 2017 budget. The N 7.441 trillion budget was passed after third reading , raising the budget from N7.28 billion earlier proposed by President Muhammadu Buhari in December last year, to N7.44 trillion.The Appropriations Committees of the Senate and the House of Representatives separately presented their harmonised reports of the budget for consideration and subsequent passage on Thursday. According to the report, N434.4 billion was appropriated for statutory transfers to the National Judicial Council (N100 billion); Niger Delta Development Commission (N64.02 billion); Universal Basic Education (N95.2 billion); National Assembly (N125 billion); Public Complaints Commission (N4 billion); INEC (N45 billion); and National Human Rights Commission (N1.2 billion). 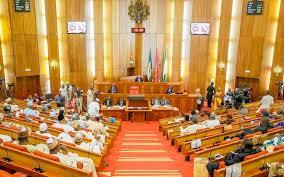 The National Assembly also appropriated N2,987,550,033,436 for non-debt recurrent expenditure of the MDAs that are not under statutory transfers club. Capital expenditure is slightly less, taking N2,177,866,775867.